The Lenovo ThinkPad T420 is an impressive business class laptop that offers a lot of power packaged into a slightly smaller than average size that yields much improved battery consumption. It features a wide variety of configurations including support for Intel Core i3, i5, and i7 processors, up to 8 GB of DDR3 1333 MHz memory, Windows 7/Vista/XP in 32 or 64 bit, 7200rpm hard drive options going up to 500GB or SSD storage up to 160GB. 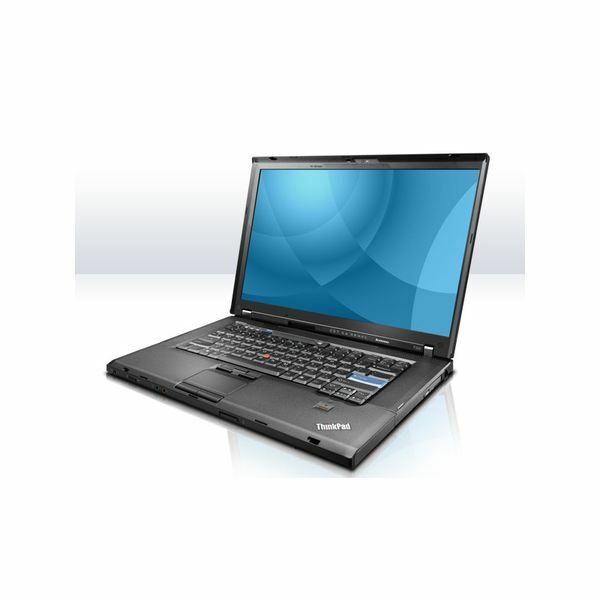 It also has a unique feature called Lenovo Enhance Experience 2.0 which uses RapidBoot technology to boot Windows 7 systems about 20 seconds faster than other models. Lenovo rates the standard battery to last up to nine hours, but realistically it'll be more like six or seven for most users. Part of this extended battery life has to do with the smaller size screen which uses less power. This is still much better than average for what you might get on a 15 inch model, where battery life typically lasts about four hours. Thanks to the Intel Core i5-2520M processor running at 2.5 GHz and four gigabytes of RAM, this machine is peppy. Internet Explorer opens almost instantly and Office applications open and close just as fast, especially after they've been loaded for the first time. The Windows Experience Index rating for this machine gives the processor a 7.1 out of 7.9 rating. I copied several large files (300+ megabytes) from across a network connection and they completed within seconds. 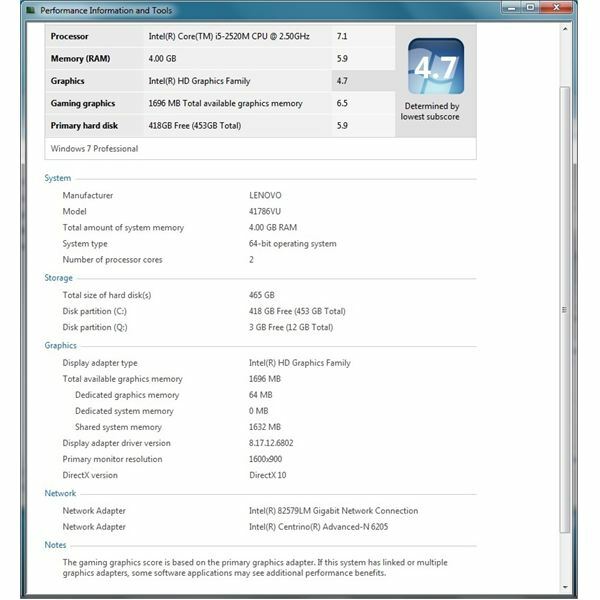 For further testing, I downloaded PerformanceTest 7.0 for free from Download.com and ran some benchmarks on this machine. It scored an overall PassMark rating of 1122.8. Although the CPU and graphics tests scored pretty well, the hard drive benchmarks were among the lowest ratings compared to other similar models, like a Lenovo ThinkPad X1 with the same processor. This model has a 7200 rpm drive whereas some models have SSD (solid state drive) that is much faster. Expanding the system RAM from four to eight GB would also make a difference in performance, especially since more could be dedicated to the graphics. The 1600 x 900 native resolution of the display is great, but that 900 pixel height can lead to some extra scrolling when dealing with long web pages or Office documents. As a point of reference, the MSN.com home page only shows about half the News section below the Editor's Picks links. The extra wide screen is great for document creation when you have a lot of menus and toolbars on the side of the screen, plus it's good for watching widescreen movies. The main thing holding back the performance on this machine is the integrated Intel HD Graphics system. During the PassMark test, the screen become choppy while running 3D benchmarks. It yields the lowest score of 4.7 on the Windows Experience Index and only has 64 MB of dedicated graphics memory although it can share another 1.5 GB of system memory if you were to add more RAM. It does support DirectX 10 and can support a resolution of 1920×1080 to a secondary monitor. You can purchase the NVidia NVS 4200M graphic chipset for slightly better performance, but don't expect a great improvement. The NVS 4200M is a low-end graphic solution that's not meant for serious gaming. I really like the design of this ThinkPad. The casing is housed in textured plastic that is soft to the touch and feels nice, though it may show scratches after a lot of use. The touchpad uses a bumpy surface that's a little weird at first, but you get used to it. The screen hinges are very stiff and the screen itself is rigid thanks to a reinforced area at the top. The latch system for holding the screen down seems a little old fashioned, though. One very interesting feature about the layout of the ports is that on the right side it places a USB port right above an eSATA port and what's cool is that the eSATA port will also work as a USB port. It also has a 4-in-1 memory card slot and a DisplayPort, but no HDMI. I liked that there were no ports anywhere on the front. Another great feature is the always-on USB port on the back. This lets you use the port to recharge devices like your phone or iPod without having to turn the computer on, so long as it's plugged in. All the USB ports are 2.0. It would be nice to have the newer USB 3.0 option, but it wasn't available on this model. As for the keyboard, it looks and feels great, and it's very quiet. The keys are of normal size and Lenovo placed the PrtSc, ScrLk, Pause and Insert keys above F9-F12 in a brilliant space-saving move. It also gives you a full size Esc key and volume controls. I did not, however, like the placement of the Fn (function) key to the left of the Ctrl key because I kept hitting Fn-Alt-Del instead of Ctrl-Alt-Del when logging onto a domain. This is a common trait on ThinkPad laptops, but that doesn't make it less annoying. The ThinkPad T420 is packed with features you won't find on a lot of other models, but those extra bells and whistles do come at a price. Overall, this is a solid machine that should more than meet your mobile computing needs. 14" screen cuts down on power consumption. Always-on USB port is very nice. Slightly more expensive that comparable models from HP or Dell.